As a man of opportunity, Mr. Robert B. Colborne purchased Wetaskiwin Motors Ltd in 1956 and moved his young family to Wetaskiwin where he lived as an active member of the community. He served as President of the Kinsmen Club, Chamber of Commerce member, and served a term as Mayor of the City of Wetaskiwin. Due to the pressure of his ever-expanding company, the Pacific Western Transportation, the Colborne family moved to Calgary but continued their connection and friendship with Wetaskiwin. 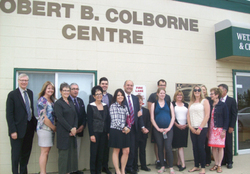 Mr. Colborne always felt it was important to give back to his community. Although he passed away on May 15th, 2012, his spirit of giving carried on June 12th, 2014 when the Boys and Girls Club of Wetaskiwin was honoured to be the recipient of a gifted building by the Colborne Family. The facility houses the new Wetaskiwin Early Learning and Child Care Centre (daycare). The generous gift received by the Boys and Girls Club pays tribute to Mr. Colborne’s achievements as a pioneer, visionary, and innovator, but also to a greatly missed husband, father, grandfather and great-grandfather. The facility has officially been named the Robert B. Colborne Centre. Robert B. (Benton) Colborne, (January 11, 1927 – May 15, 2012), Founder and Chairman of the Pacific Western Group of Companies, was a compassionate and generous man of integrity. Mr. Colborne began his career in 1949 with General Motors Acceptance Corporation working both in Calgary and Edmonton. Mr. Colborne was an innovator, and had tremendous confidence in people. He built one of North America’s largest, privately held, people transportation company which serves British Columbia, Alberta and Ontario. Mr. Colborne’s passion was to elevate passenger transportation and safety, and one of his innovations was the introduction of Alberta’s very successful Red Arrow Motorcoach Service. Over the years, he served as President of the Western Canada Motorcoach Association, and made many substantial contributions to the industry, resulting in the Ontario Motor Coach Association honouring him with a life-time Achievement Award. For more information please contact: Debbie Pearson, Fund and Communications Coordinator 780-352-4643 Ext. 32 or debbie@wetaskiwinyouth.ca.